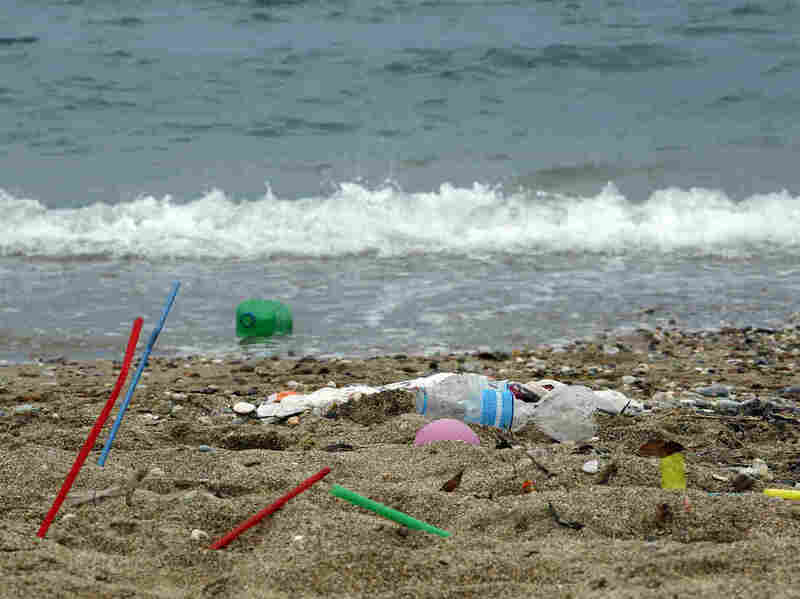 European Parliament Approves Ban On Some Single-Use Plastics, Reduction On Others The move would impose a complete ban on some single-use plastics across the European Union and a reduction on others, aiming to implement most measures by the mid-2020s. Plastic garbage lying on the beach in Greece. The move would impose a complete ban on some single-use plastics across the European Union and a reduction on others, aiming to implement most measures by the mid-2020s. "We have adopted the most ambitious legislation against single-use plastics. It is up to us now to stay the course in the upcoming negotiations with the Council," Belgian MEP Frédérique Ries said in a news release. "It is essential in order to protect the marine environment and reduce the costs of environmental damage attributed to plastic pollution in Europe, estimated at 22 billion euros by 2030." The legislation calls for direct bans on single-use plastic items such as "plates, cutlery, straws, balloon sticks or cotton buds" by 2021. Consumption of single-use plastics "for which no alternative exists," such as single-use food boxes or containers for fruits, vegetables or ice cream, must be reduced by at least 25 percent by 2025, according to the legislation. The measure also cracks down on fishing gear, such as monofilament fishing line, and tobacco waste. It seeks to reduce waste from tobacco products and cigarette filters containing plastic by 50 percent by 2025 and 80 percent by 2030. "Member states should also ensure that at least 50 percent of lost or abandoned fishing gear containing plastic is collected per year, with a recycling target of at least 15 percent by 2025," the release said. "Fishing gear represents 27 percent of waste found on Europe's beaches." The measures also held tobacco producers and producers of fishing gear containing plastic more accountable — companies in those industries must cover the costs of waste collection for their products, "including transport, treatment and litter collection." The European Parliament also seeks to recycle a target of 90 percent of all recyclable drink bottles by 2025. The measures are the latest in a growing, global movement to reduce single-use plastic waste. 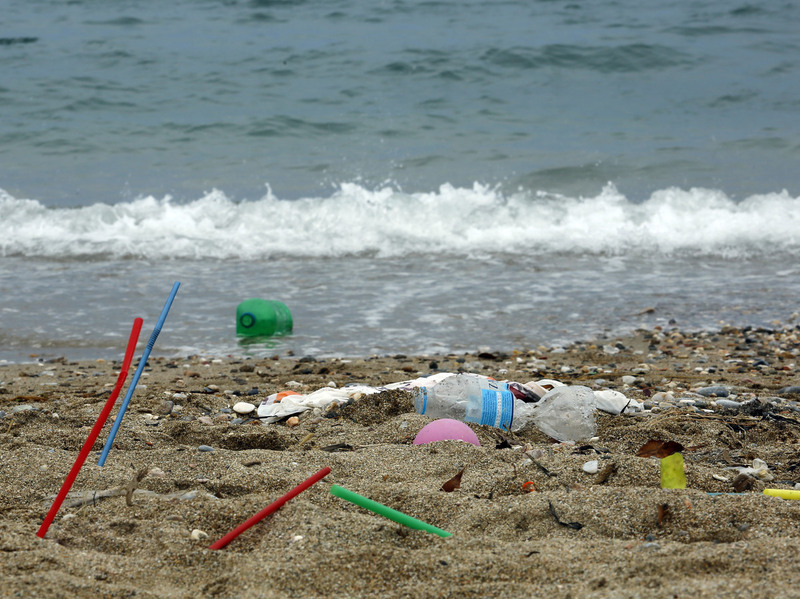 According to the European Commission, plastic makes up more than 80 percent of marine litter. "Each year, more than 8 million tonnes of plastic ends up in the oceans, wreaking havoc on marine wildlife, fisheries and tourism, and costing at least $8 billion in damage to marine ecosystems. Up to 80 per cent of all litter in our oceans is made of plastic. "According to some estimates, at the rate we are dumping items such as plastic bottles, bags and cups after a single use, by 2050 oceans will carry more plastic than fish and an estimated 99 per cent of seabirds will have ingested plastic." The movement to eliminate plastic straws spread across the U.S. and other parts of the world this summer. Starbucks said it would drop plastic straws worldwide by 2020, and Marriott International said it would do the same by next summer. McDonald's said it would use paper straws instead of plastic ones in some 1,300 restaurants in the U.K. and Ireland. A previous version of this story misspelled Marriott International as Marriot International.